It was fantastic to see so many students in cultural dress or in orange today to celebrate Harmony Day; a day when Australians celebrate our cultural diversity. The day is also the United Nation’s International Day for the Elimination of Racial Discrimination. To support this, we spent the day working in multi-age house groupings completing various activities aimed at celebrating and embracing our diversity. 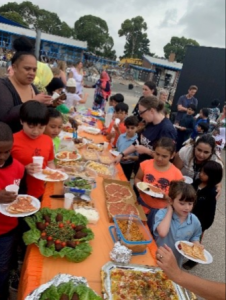 Our annual shared Feast (lunch) was also a huge hit with many yummy plates of food coming in throughout the morning and many parents joining us for the feast. Thank you to everyone who contributed to our day either in national dress, bringing some cultural food or enjoying the activities held. I’m already looking forward to our 2020 celebrations! Check out our newsletter next week for a double page spread on all the wonderful celebrations from the day. Students will have brought home their raffle tickets and information this week. Please try and sell the book of tickets allocated to your family. If you would like further raffle books, please visit the office. Remember the 3 families with the most raffles tickets sold will win a prize! Next term students across the country in Years 3, 5, 7 and 9 will be assessed using common national tests in Reading, Writing, Language Conventions (Spelling, Grammar and Punctuation) and Numeracy. The results from these tests will further assist us in making sure that we are meeting the needs of our students. That may be through identifying students who require additional support and extension, or identifying areas of focus for future curriculum goals and planning for our staff. If your child is in Year 3 or 5 and you DO NOT want them to sit NAPLAN, please let Sam Fleming know ASAP. We need parents to sign a form in order to withdraw their child from testing. Tours of our wonderful school for families interested in enrolling their child in 2020 have already begun. If you would like a tour, have friends or neighbours who would like a tour please contact the school to book a place. If you have a child due to start in 2020 please complete your enrolment and drop it off at the front office. Should you know of a child due to start school in 2020 please remind their parents to hand in their enrolment forms and attend our info sessions on Wednesday 3rd April. If you have questions, feedback or are experiencing any difficulties please don’t hesitate to contact either Sam, Sam or myself via phone, sending us an email or come and have a chat.